As the holidays approach, you may be getting ready for a trip to see family and enjoy good food. Recently several staff from the National Library of Medicine (NLM) took a field trip over the river and through the woods—well actually across the Beltway—to visit our colleagues at the National Agricultural Library (NAL) in Beltsville, Maryland, to learn more about their food-related collections and their exciting work in the areas of digitization, access, and preservation. Both libraries began as departmental offices. NAL was established in 1862 as the U.S. Department of Agriculture Library when President Lincoln signed the Organic Act while NLM began in 1836 as the Library of the Surgeon General of the U.S. Army, only 26 years apart. Both libraries moved several times over the next 100 years or so as collections grew. Official “National” designations came only 6 years apart. In 1956 the National Library of Medicine became a national library and part of the Public Health Service under the Department of Health, Education, and Welfare. NAL followed in 1962 as a national library under the Department of Agriculture. And our current buildings were both built in Maryland in the 1960s, NAL in 1969 and NLM in 1962. Today, as the national libraries for medicine and agriculture, both institutions collect, preserve, and provide access to their respective world-renowned collections of publicly-held materials. 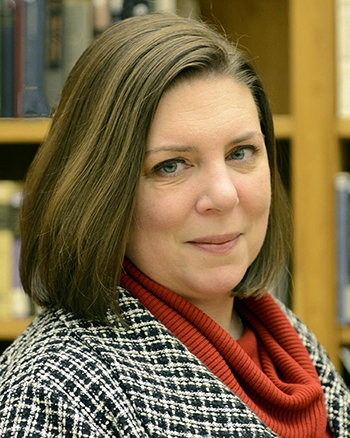 Jill James, NAL’s ‎Associate Director for Information Products, greeted us warmly and escorted us to the fifth floor, where her colleagues Susan Fugate and Amy Morgan, both Special Collections Librarians, guided us through a curated display of items from NAL’s special collections. Among them were those of Frederick Coville, botanist for the U.S. Department of Agriculture, who was one of the first to develop blueberries that could be sold commercially. We also learned about selections from NAL’s extensive collection of over 200,000 nursery and seed trade catalogs. These catalogs date from the late 1700s through present day and document the costs of seeds over time, the introduction of seeds, and gardening and farming trends. Our tour with Susan and Amy concluded with a discussion about several beautiful pieces of art including a replica of a Smokey Bear painting and several rare drawings of plant specimens. Amy Morgan displays a field research sketchbook. Susan Fugate talks about Smokey Bear. 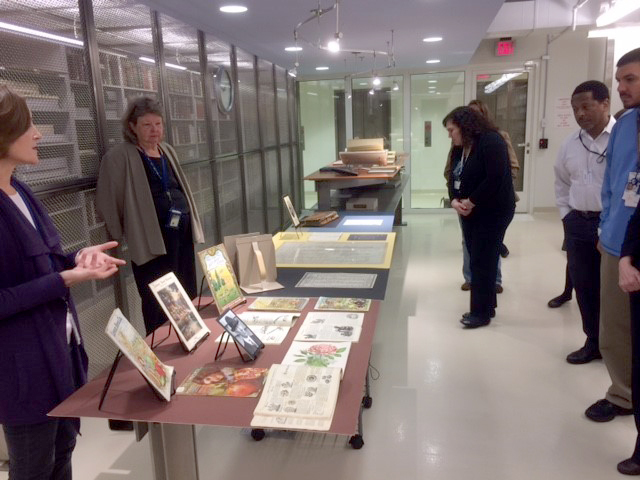 Following our time with Susan and Amy, we had the opportunity to learn about NAL’s state-of-the-art facilities where they preserve their special collections and enable researchers and other interested individuals to study them. We were especially excited about this as we continue our work at NLM to ensure that our own facilities remain state-of-the art as our institution moves into its third century. Jill concluded our tour with a visit to the 14th floor—the top of the NAL building—where we could see the laboratories and research plots of the Agricultural Research Service and, in the far distance, the Washington Monument. Although the focus of our respective Libraries—medicine and agriculture—may seem different at first glance, there are many areas where our collections and programs intersect. For example, both institutions hold historic recipe books and cookbooks, herbals, and other materials related to nutrition. In addition, we are undertaking complementary activities like digitizing our collections, making them publicly accessible, creating controlled vocabularies to enable indexing and retrieval of information, Medical Subject Headings (MeSH) here at NLM, and, at our colleagues’ institution, the NAL Thesaurus, and developing methods—drawing from the expertise of multiple disciplines—to collect, curate, preserve, and provide access to data sets. Thanks to our colleagues at NAL for meeting with us and sharing their experience and expertise. We look forward to welcoming them at NLM and exploring ways we can work together in exciting and mutually-supportive ways.